A high quality industrial abrasive made for extended general purpose grinding on metals, castings, welded joints, rivets and rust. Specially designed for working with conic surfaces. Do not run in excess of 30,000 RPM. 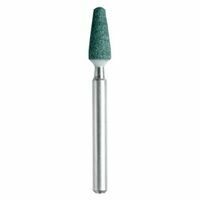 A high quality industrial abrasive made for extended general purpose grinding on metals, castings, welded joints, rivets and rust or for working with conical surfaces. Do not run in excess of 30,000 RPM. Polish silverware to high luster, car detailing and restore door and window hardware. Compatible with all Dremel rotary tools, EZ402 EZ Lock mandrel and standard 402 mandrel (619.9400). Do not run in excess of 30,000 RPM. For cleaning, light sanding and removing tarnish from brass. Use on metal, glass, wood, aluminum and plastics. For use with the EZ402 EZ lock mandrel (SKU #482.4447) or standard 402 mandrel (SKU #619.9400). Includes 2 fine 320 grit buffs. Rubber polishing points are impregnated with abrasive and used on on ferrous metals to remove rough areas, small burrs and scratch marks. Point is ideal for cleaning and defining grooves. A cylinder covered with aluminum oxide abrasive that sits atop a mandrel with a 1/8" shank. For rough shaping and smoothing wood and fiberglass. Ideal for removing rust from metal surfaces. Also ideal for shaping rubber surfaces. 1/4" bit diameter (6.4 mm). Pack of 6. 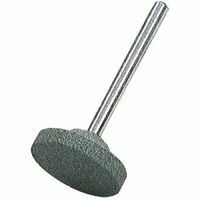 Dremel Grinding Stone, 25/32 in Diameter, 1/8 in Arbor/Shank, Silicon Carbide Abrasive, Silver, For Sharpening, Deburring and General Purpose Grinding on Harder Materials Cuts wood, plastic, fiberglass, drywall, laminate and aluminum and vinyl siding. Do not run in excess of 30,000 RPM. Ideal for cleaning and removing rust and corrosion from items made of brass, copper, gold or other soft ferrous metals. Perfect for getting into hard to reach places like slots. You can also use wire brushes to create an artistic effect on coarse-grained wood. Its shape makes it well suited for cleaning flat surfaces.